Splitsko-Dalmatinska (Split-Dalmatia) County may be Croatia's most delightful county; certainly it would count as the most touristed. It's here that you find some of Croatia's loveliest islands such as Brac, Hvar and Vis. The indented coastline has some spectacular beaches, most notably at Brela and Baska Voda. The hinterlands are marked by karstic mountains with fertile fields and bucolic valleys. The Cetina river runs through the centre and is one of Croatia's best rafting destinations. The main entryway to the region is Split, site of Diocletian's Palace and with loads of ferries, buses and trains to whisk you throughout the region. The beauty of the region made it most attractive to the Romans who chose Salona as their administrative centre. The Roman ruins of Salona (Solin) make for an interesting visit. Further north is Trogir, a walled city that serves as a magnificent showcase for medieval architecture. To the south is the former pirate's lair of Omis and Makarska underneath Biokovo mountain. The region bears strong influences from Venice, which ruled this part of Dalmatia for many centuries, erecting fortresses to protect their holdings from attacks by the Ottoman Turks. The fortress at Klis is an impressive example of a medieval defensive structure fortified by the Venetians. Another reminder of the region's turbulent history occurs each year at the fortress in Sinj. 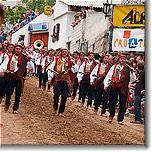 The Alka is a festival run every year in August by the Sinj Knights to commemorate victory over the Turks.